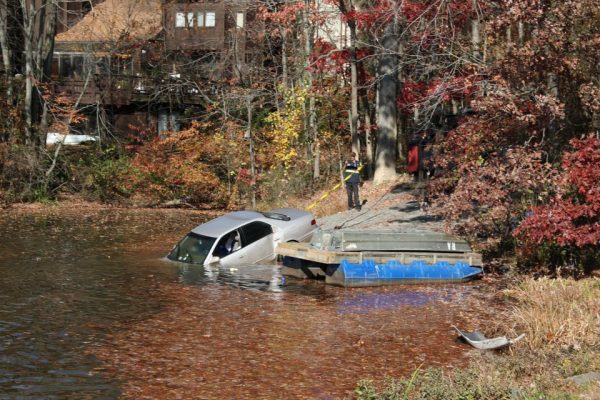 (Updated on Nov. 17 at 8 p.m.) Someone drove their car off of Wiehle Avenue and ended up in Lake Anne late Wednesday afternoon, according to the Fairfax County Police Department. The driver. a 45-year-old man, and one passenger, a 7-year-old girl, were able to escape the car with no injuries, thanks to the help of Good Samaritans walking by, but the car was completely submerged in the lake, police said. Due to how early darkness falls in November, police decided to wait until the next morning to remove the car from the lake. Fairfax County Police divers began working to remove the car from the lake sometime before 9:50 a.m. Thursday morning.